Antique barn wood top. Painted Checkerboard. 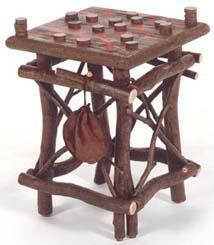 Red and black game pieces made from willow branches. Handmade leather drawstring storage bag hangs on branch hook.